The funniest book about herpes you’ll read this year. Let me make my opinion clear from the outset: this book is superb. A work of genius. I don’t think anyone is able to graphically imbue their characters with such a sense of anxiety and dejection as Ken Dahl does. I could not put this book down, and seriously annoyed my girlfriend by reading it in bed when she was trying to sleep. It made me laugh out loud, chortle and cringe and the air was punctuated ‘Oh NOOO!’s and ‘HAHAHA’s until I was told in no uncertain terms to ‘PUT THE BLOODY LIGHT OUT’. 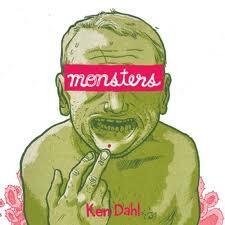 Herpes, obviously, isn’t funny, but Ken is funny, his drawings are funny, the way his characters morph into dogs, viruses and monsters is funny and his observational humour is spot on. Anyway – the story…. it is ‘semi-autobiographical’. Ken has a cold sore. He’s blissfully happy with his girlfriend Rory until he transfers his Herpes Simplex type1 to her ‘nether regions’, at which point things start to deteriorate. His love life and emotional well-being take a big turn for the worse. He manages to accidentally infect at least one other girl, who never forgives him, and is publicly humilliated by his friends, who by now all know what he has done. As pain and guilt eat into his psyche, he starts to see himself as an oozing, STD-ridden monster. He seeks solice in abstenance, but finds the lack of human contact unbearable. He has no health insurance and cannot afford expensive antivirals, so arms himself with an arsenal of dubious naturopathic remedies. Redemption is found, however, in self education and the love of a good woman, and the story has a hopeful ending. There is a lot of information in this book. It does an excellent job of informing the reader about living with Herpes. It also says a lot about life, friends, love and, er, worrying excessively. It should be required reading for any healthcare professional with even a passing interest in Genitourinary Medicine, but Hell, forget education, the reason you should buy this book is because it is just such a good story… a tragicomic drama of the first order. After reading this I had to get ‘Welcome to the Dahl House’ which is a collection of strips, zines and minicomics. It too is brilliant.